Quantity: An average of 23 pounds is needed per canner load of 7 quarts, or an average of 14 pounds per canner load of 9 pints. A bushel weighs 53 pounds and yields 15 to 18 quarts of juice - an average of 3¼ pounds per quart. 2. Wash, remove stems, and trim off bruised or discolored portions. 3. To prevent juice from separating, quickly cut about 1 pound of fruit into quarters and put directly into saucepan. Heat immediately to boiling while crushing. Continue to slowly add and crush freshly cut tomato quarters to the boiling mixture. Make sure the mixture boils constantly and vigorously while you add the remaining tomatoes. Simmer 5 minutes after you add all pieces. 4. Press both types of heated juice through a sieve or food mill to remove skins and seeds. 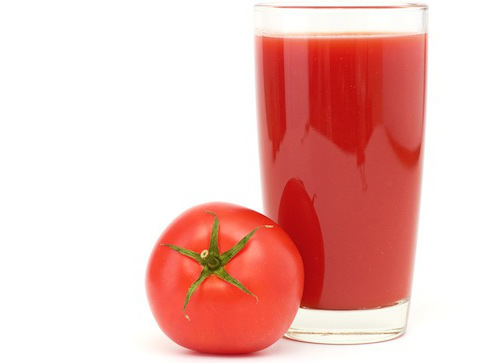 To ensure safe acidity in whole, crushed, or juiced tomatoes, add two tablespoons of bottled lemon juice or 1/2 teaspoon of citric acid per quart of tomatoes. For pints, use one tablespoon bottled lemon juice or 1/4 teaspoon citric acid. Acid can be added directly to the jars before filling with product. Add sugar to offset acid taste, if desired. Four tablespoons of a 5 percent acidity vinegar per quart may be used instead of lemon juice or citric acid. However, vinegar may cause undesirable flavor changes. 6. Heat juice again to boiling. 7. Add 1 teaspoon of salt per quart to the jars, if desired. 8. Fill jars with hot tomato juice, leaving 1/2-inch headspace. 9. Wipe rims with a clean damp cloth, adjust lids, and process in either a boiling water canner or pressure canner according to the recommendations.